Average Weight	: 4 - 9 lbs. 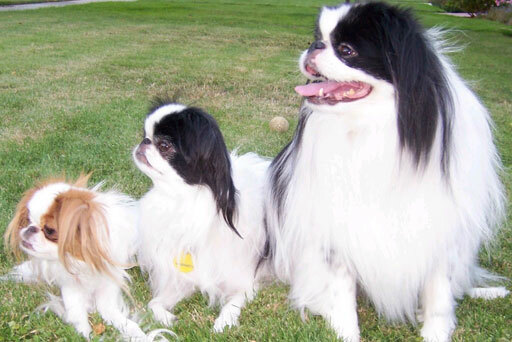 Japanese Chin Care and Rescue Effort ~ AL/FL Coord. The Japanese Chin is first and foremost bred as a companion dog. Despite the name "Japanese" the breed is native to the land of China. It was later developed in Japan and introduced to Europe in 1700. It became a favorite of Japanese nobility, and was often offered as a royal gift to diplomats and to foreigners who rendered some outstanding service to Japan. In 1853 a pair was given as a gift to Queen Victoria from Commodore Perry when he returned from his historic mission to open Japan to world trade. The Japanese Chin is a happy and lively breed. The breed is intelligent and can be affectionate with those that it knows and trusts. When properly taken care of it is extremely devoted to its owner. While this breed often loves everyone it is familiar with, it is also known to be somewhat aloof with strangers. It can also be somewhat reserved when it is in unfamiliar situations or locations. For the most part, the Chin is good with other dogs and pets that may live in the home with it. Even though the Japanese Chin is a loving and kind breed, it does have a mind of its own and likes to be the center of attention. When this attention is not given to it, it can become jealous and brooding. The Japanese Chin is considered to be more obedient than most other toy breeds and good dogs for learning tricks. The Japanese Chin will have many of the same problems that all short-faced breeds will have. The Japanese Chin tends to wheeze and snore. Generally speaking, this is normal and should not cause alarm. If it progresses, however, it should be taken to the vet for exam. The Japanese Chin may be prone to luxating patella which is also known as slipping kneecaps. This ailment can usually be caught early on during Routine exams. The Chin are also prone to Cataracts in the eyes. This is one reason it is important to have its eyes checked during every exam. The Chin is also prone to eye and respiratory problems and heat prostration if it is left in hot areas such as inside the car during the summer months. Some Chin lines can be prone to distemper. Your veterinarian may choose to adjust the immunization schedule if this is a issue with your animal. The Chin is an easy breed to care for and it only takes a few minutes each day to keep the coat looking wonderful. The owner should comb out tangles that occur in the coat. The coat is a single layer, silky and straight and is not prone to matting. This breed is an average shedder. There is a preferred way to brush this breed and any professional dog salon can show you the correct technique. The idea is that the hair should be brushed with a lifting motion so that it stands up in a soft plume. While the Chin is shedding it is a good idea to brush them more frequently. The teeth need to be kept clean as well but it should be noted that the Chin does not always like having its teeth examined or touched. If the owner is not able to perform this grooming task, a pet salon should be used. Proper dental care is extremely important as it helps your pet to keep its teeth for as long as possible. The hair between the pads of the feet should be trimmed when it becomes long. Baths should be given only when needed. The Japanese Chin is a low level breed for exercise. This means that the dog does not require a lot of exercise. It enjoys a walk, but care must be taken when walking the dog as other animals may attempt to attack it. The Chin can enjoy playtime within the home or apartment and that can suffice for its exercise. This can be very helpful for older owners who may not be able to participate in strenuous activities. The Chin is well suited to learning tricks and this, too, can suffice as exercise. As mentioned above, the Japanese Chin is very intelligent and willing to please its owner. These attributes make training the Chin easier than other toy breeds. Even so, the Chin can be stubborn and willful at times. The best time to begin training is early on in life. Even at an early age they are capable of learning the basics of obedience and they can begin housebreaking as well. They are a clean breed so house breaking them is usually not a problem. If at all possible early socialization is best. This is especially important if there are small children in the home with the dog. While the Japanese Chin will get along with other animals that live in the house, it is best to also begin socialization training for that as early as possible as well. The Chin is not an aggressive breed and will usually get along fine with other animals once it has had a chance to be around them in a safe environment. This breed is quickly becoming known for its excellent learning ability in the agility events. Even those owners who do not plan to place the animal in a show event will find that the Chin is very capable of doing simple exercises such as jumping over lines or going under lines. Agility training is best begun when the dog is at least two years old. Beginning to train it any earlier than that and it may not be as receptive to the training.